MOSCOW, December 28. /TASS/. 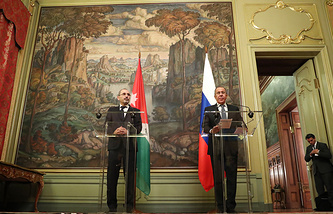 Russia believes that the West’s refusal to help Syrians reconstruct their country is counterproductive and against the norms of international humanitarian law, Russian Foreign Minister Sergey Lavrov told reporters after a meeting with his Jordanian counterpart Ayman Safadi. "We want refugees to return in full compliance with the norms of international humanitarian law, including ensuring their security, their property rights and decent living conditions in the areas where they will come back," Lavrov said. "Russia has already helped the Syrian government create normal living conditions, including ensuring water and electricity supply, education for children, medical services in the settlements, where tens of thousands of refugees have returned and continue coming back," Lavrov said. "I believe that the West’s refusal at this stage to do the same and help Syrians reconstruct normal life conditions across the country, which would enable refugees return calmly and confidently, is counterproductive and against the norms of international humanitarian law and human rights," Lavrov stressed. Russia seeks the West’s guarantees of supporting the Syrian refugees’ return at a forum in Brussels. "In the first month of next year another conference on aid to Syria and assistance in its reconstruction effort will be held in Brussels," Lavrov said. "We will strive for the Western donors’ full acknowledgement of their responsibility here and review of their negative position on the contribution to creating conditions in entire Syria for the refugees’ return. ".